Top Munro is a top trumps style card game featuring your favourite Scottish hills. There are 282 Munros in total (Scottish hills over 3000 feet), and this Classics collection allows 2 or 3 players to play easily. Full instructions are included. Each card features a photograph of a Munro and six key facts about that hill, a potential route to climb it and the pub you can visit afterwards. 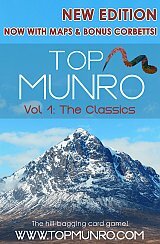 Vol 1: The Classics are 100x62mm plastic coated trumps cards featuring 30 'Classic' Munro mountains.